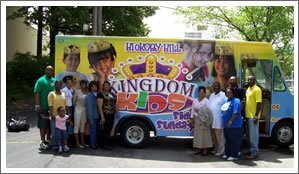 Sidewalk Sunday School is an outreach of WOOMC designed to “take church to the children” in the Hickory Hill community. This outreach began in response to a statistic that showed that parents wanted their children to participate in more constructive, productive activities. The Sidewalk Sunday School truck visits apartment complexes in the immediate area and teaches children biblical and moral values such as: respect for parents and authority, character and integrity. These principles will be taught through games, music, skits, puppetry, dance and teaching. This initiative fosters connection between children and parents. For more information, please contact Heather McLemore at (901) 844-3849 or e-mail her at hmclemore@woomc.org.